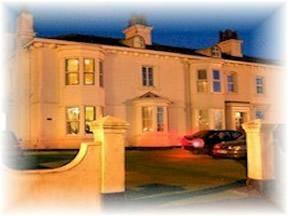 Choose from 57 hotels and guest houses in Merseyside. Shown below a just a selection of the hotels available. To search within an area please use the menu on the right. Named Sunday Times Overall Winner of The Good Hotel Guide 2005 'Cesar' Awards. 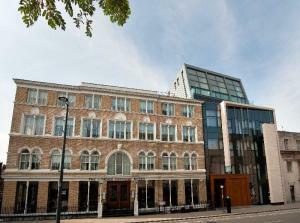 Liverpool's first and only design hotel offering the ultimate in understated luxury and an attentive personal service. Hope Street Hotel is Liverpool's first boutique hotel, centrally located between the cathedrals in the city's cultural quarter, just across the road from the concert hall and surrounded by theatres and restaurants. Built in 1860 in the style of a Venetian palazzo, Hope Street is a delightful, privately-owned, design hotel, passionately run with thoughtful service and comfortable contemporary interiors. 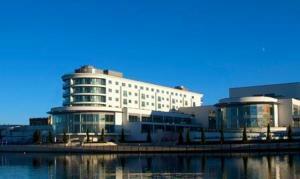 The stylish and modern Ramada Plaza is a new waterfront development on Southport's promenade. It is opposite Floral Hall Theatre and Conference Centre. The hotel is close to shopping at Lord Street, and is within 20 minutes of 6 championship golf courses, including Royal Birkdale. At Ramada Plaza Southport you will find Wi-Fi access, free parking and Marine Brasserie for dining. The spacious rooms have been individually designed with a sophisticated style and elegance. There are 3 fully equipped meeting rooms with Wi-Fi, and a large function room with a large glass wall overlooking the marina. Just 400 yards from the M57/M62, this modern hotel has a leisure club (with swimming pool), restaurant, pub and cafe, all within easy reach of Liverpool (8 miles) and Warrington (15 minutes). The Village Hotel has ample free parking and free Wi-Fi internet access throughout all areas of the hotel. During your stay, visit the hotel's superb leisure club, with a swimming pool, steam room and sauna. Experience the popular Verve Grill Restaurant, the newly refurbished Victory Pub, or the relax in the Vibe Cafe. All bedrooms were upgraded in August 2008 with quality beds (Sealy Palatial Crest range) and new bedding. From the Village Hotel Liverpool you can explore local attractions like Knowsley Safari Park, Knowsley Hall, and both Aintree and Haydock Race Courses. Liverpool John Lennon Airport is just 8 miles (13 km) away. Near the M57/M58, with free parking, this hotel is 1.5 miles (2.4 km) from Aintree Racecourse and a short walk from Old Roan Rail Station (trains to central Liverpool in 17 minutes). The Premier Inn Liverpool North hotel has comfortable en suite rooms and an on-site Beefeater restaurant serving fresh char-grilled food. This Premier Inn hotel is well placed for Switch Island Retail and Leisure Park. The hotel is 4.5 miles (7 km) from Goodison Park (home to Everton FC) and 5.5 miles (9 km) from Anfield (home to Liverpool FC). Some rooms can take 2 adults and up to 2 children (under 16 years). The 2 children also get a free full breakfast when accompanied by an adult eating a full breakfast. The full all-you-can-eat breakfast has the expected cooked items, including vegetarian sausages, as well as a wide continental selection. Opposite the terminal at Liverpool John Lennon Airport, this modern hotel offers air-conditioned rooms, parking and free internet access. The Hampton by Hilton Liverpool John Lennon Airport has spacious en suite rooms, all with modern comforts and facilities. A hot buffet breakfast is available every day and there is a supper menu for guests, with light snacks available throughout the day. The bar offers draught beers, spirits, wines and soft drinks. Guests have free use of the in-house gym facilities, which include treadmills, exercise bikes and weights. The hotel has easy access to the M62 motorway and Liverpool's city centre is only 8 miles (13 km) away. Right next to Aintree Racecourse, this Premier Inn hotel has free parking, comfortable en suite rooms, and is a 5-minute walk from Aintree Rail Station (trains to central Liverpool in 15 minutes). Within reach of the M57/M58 motorways, Premier Inn Liverpool Aintree is 3 miles (4.8 km) from Goodison Park (home to Everton FC) and 4 miles (6.4 km) from Anfield (home to Liverpool FC). Some rooms can take 2 adults and up to 2 children (under 16 years). The 2 children also get a free full breakfast when accompanied by an adult eating a full breakfast. The full all-you-can-eat breakfast has the expected cooked items, including vegetarian sausages, as well as a wide continental selection. Standing on Lord Street, Southport, one of the best shopping streets in the North West, this contemporary boutique hotel provides stylish interiors, comfortable furnishings and a luxurious spa. The Vincent is a 6-storey hotel, fully equipped all that you need for a relaxing stay, whether you are on business or leisure. The V-Spa features a high-tech gym, personal trainer and rooms offering a range of beauty treatments. For business events and special occasions The Vincent offers multi-function rooms, fully equipped with the latest technology. Depending on your choice of room and layout, the rooms can hold up to 200 people. Formby Hall combines the charm of a boutique hotel, with the delights of a 4-star luxury spa hotel and golf resort on the Golf Coast, near Southport and Liverpool. Following an extensive ?10 million development, you are now welcomed to an impressive new experience. A grand colonial-style clubhouse and an existing 18-hole championship golf course have been joined by a 62-room hotel and, most recently, a lavish spa and health club, providing relaxation, pampering and rejuvenation. The hotel is also pleased to announce the opening of a superb new 9-hole par-3 course, with a new driving range and a unique residential PGA academy. The superbly equipped health club and our vibrant restaurant and bars make Formby Hall the ideal destination for either a short break or golf weekend. This beautifully decorated hotel is located in Liverpool's district of art and culture and overlooks vibrant Queen Square, opposite Lime Street station. 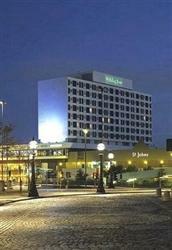 The hotel was opened in 1998 and is very well located for a stay in Liverpool. Eat in classic Olivier's Restaurant, or enjoy a cappuccino in the coffee bar. Liverpool Marriott Hotel City Centre has an indoor swimming pool and a fitness centre for when you have a few moments to relax. The Liner is quite simply a hotel like no other. Step inside and you will be transported back to the golden age of ocean travel, when only the highest standards of comfort, quality and service would suffice. From the brass portholes to the welcoming and dedicated crew, The Liner bears all the authentic hallmarks of the world's finest cruise ships. This Grade II listed building built in 1861 consists of 4 Victorian villas which opened in early 2008, and are situated 15 minutes from the heart of the city centre. The hotel provides a warm and friendly atmosphere as well as providing comfort and convenience. Whilst visiting Liverpool you can enjoy the busy night life, local tourist attractions which include the Albert Dock, museums and cathedrals. Liverpool Football club is a short distance from the hotel. Awarded 4 stars by Visit Britain, this beautiful Grade II listed building is situated on Southport's promenade, just opposite the pier, boasting spectacular views across the seafront. Just a short walk from the famous Lord Street with its many shops and quintessential tea rooms, the Alexandra and Victoria is the ideal place to stay. It is also minutes away from the newly refurbished train station which has direct links to both Manchester and Liverpool. Set within one of the town's distinctive original Victorian villas, the family-run Alexandra & Victoria Hotel aims to offer the best in customer service within a welcoming and friendly atmosphere. Ideally located in the heart of Liverpool, The Holiday Inn Liverpool City Centre is opposite Liverpool Lime Street Train station and 8 miles (12.9 km) from Liverpool John Lennon Airport. 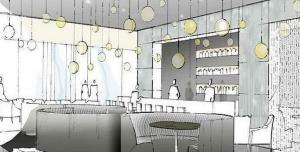 Signals Brasserie, with its panoramic views of Liverpool, provides a stylish place to dine. Guests may also enjoy a drink in the contemporary Signals Bar, with a fantastic view of Lime Street and its listed buildings. Holiday Inn Liverpool City Centre is an excellent base from which to explore the numerous theatres, bars and restaurants of Liverpool, with Albert Dock close by and Liverpool One Shopping Centre within easy walking distance. The hotel is well placed for access to Premiership football clubs. All rooms are spacious and contemporary in design, with satellite TV, in addition to an en suite with power shower and bath. Free Wi-Fi internet access is available in the hotel. Guests have complimentary use of the Mini Gym, with a range of modern training facilities. The hotel is superbly located, just off junction 23 of the M6 motorway, next to Haydock Park Racecourse, and serves as a gateway to the entire North West region. The Holiday Inn Haydock Hotel is in close proximity to Manchester and Liverpool, via the A580 that links the two cities. Also within a 15-mile radius of the hotel are the towns of St Helens, Warrington, Wigan, Leigh and Bolton. Whether you are exploring the area as a tourist or visiting the region on business, the hotel's excellent location and superb access to the area's major road network make it a convenient base. There are 136 comfortable, modern, air conditioned rooms, each with an en suite bathroom with bath and shower. All of the rooms feature modern comforts and facilities, including interactive TVs with pay-as-you-play PlayStation games and high-speed internet access via modem. Conveniently located, Premier Inn Wirral (Heswall) is 20 minutes away from the Mersey Ferry and 6 miles (9.6 km) from Hamilton Square Train Station, with good access to bus links. Some of the comfortable rooms at Premier Inn can accommodate 2 adults and 2 children (under 16 years). The 2 children are also served a free full breakfast, when accompanied by an adult eating a full breakfast. The full all-you-can-eat breakfast includes cooked items, vegetarian options and a wide continental selection. Premier Inn Wirrall (Heswall) is next to The Glegg Arms Beefeater restaurant, offering chargrilled cuisine in a welcoming environment. There is a 24-hour reception and free parking at this Premier Inn. In the heart of the city centre, opposite the Albert Dock and close to all that Liverpool has to offer, the hotel offers comfortable accommodation and secure outdoor parking at an additional cost. The Ibis Liverpool City Centre hotel has a great central location, overlooking the entrance to the Albert Dock and just a few hundred metres from the city's new Liverpool One Shopping Complex. Liverpool John Lennon Airport is just 3 miles (5 km) away. All of the pubs, shops, theatres, historic building, bars and nightclubs are within easy reach, as are Anfield, home of Liverpool FC, and Goodison Park, home of Everton FC. There are 127 en suite rooms, including 5 for guests with limited mobility. The hotel also has a restaurant and a bar offering snacks 24 hours a day. Wireless internet access is available at an additional cost. This private hotel at Waterloo, Liverpool, overlooks Marine Gardens and the Mersey Estuary, and has distant views of the Wirral and North Wales. Set in the suburbs of Liverpool, the hotel is a 10-minute drive from the city centre, Anfield and Goodison stadiums and Aintree Racecourse. Waterloo Train Station (Merseyside) is close by, and services run into Liverpool city centre. In front of The Royal Hotel is 'Another Place', an Anthony Gormley art installation, which consists of 100 life-size iron men. Winners of B&B of the Year 2007 in the Merseyside Annual Tourism Awards, this privately owned country house offers luxury bed and breakfast accommodation in a peaceful, rural setting. In a quiet, tranquil setting, but just a few minutes from the M53, this award-winning guest house is located in the picturesque conservation village of Frankby, in the heart of the Wirral. The guest house is just 15 minutes' drive from Liverpool, City of Culture 2008, and only 5 minutes' drive from the Victorian seaside towns of Hoylake and West Kirby, where there are numerous restaurants and bars. Peel Hey is also conveniently located for trips to Chester. 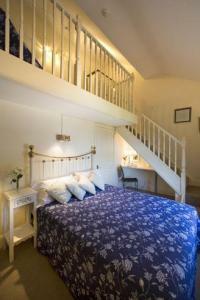 The house was originally constructed in 1885 and the luxurious and attractive en suite rooms are individually styled, combining contemporary facilities with unique charm and character. The peaceful location and great accommodation makes Peel Hey a great place for a relaxing or romantic break. Hard Days Night Hotel is housed in one of Liverpool city centres unique buildings, transformed into a luxurious 4-star boutique hotel with a theme - The Beatles. The hotel is situated in the heart of the Cavern Quarter, next to the famous Cavern Club. Elegantly furnished, each room has state-of-the-art technical facilities and its own piece of 'Shannon' artwork. Providing comfortable, good value accommodation, Premier Inn Haydock is situated near Haydock Race Course and close to local conference centres, offering the perfect base from which to explore Haydock. Some of the comfortable rooms at Premier Inn can accommodate 2 adults and 2 children (under 16 years). The 2 children are also served a free full breakfast, when accompanied by an adult eating a full breakfast. The full all-you-can-eat breakfast includes cooked items, vegetarian options and a wide continental selection. Premier Inn Haydock is next to Table Table restaurant, serving good cuisine in a welcoming environment. There is free parking and a 24-hour reception at this Premier Inn. The sleek architecture of this hotel, the 10th Malmaison in the family, blends with the modern design and sophisticated facilities within. With a prime location on Princes Dock, you need not travel far to begin exploring this vibrant city. And when you return, you'll find comfortable rooms, lush decor and hidden extras like power showers and LCD TVs. The brasserie serves simple, tasty cuisine and the Plum Bar, with its fine wines and signature cocktails, has become a Liverpool hot spot. Other Malmaison facilities include a state-of-the-art gym and 5 air conditioned modern function rooms that are naturally bright and perfect for business or private parties. Just off the M62 (junction 7), this Premier Inn hotel has free parking, family-friendly rooms and is 1 mile (1.6 km) from Rainhill Rail Station (trains to central Liverpool in 27 minutes). The Premier Inn Liverpool (Rainhill) is a 10-minute drive from Knowsley Safari Park. Some rooms can take 2 adults and up to 2 children (under 16 years). The 2 children also get a free full breakfast when accompanied by an adult eating a full breakfast. The full all-you-can-eat breakfast has the expected cooked items, including vegetarian sausages, as well as a wide continental selection. An original concept, unparalleled in the Liverpool area, this unique all-suite hotel offers state-of-the-art technology; elegant, luxurious accommodation in spacious suites; and superb facilities for the business or leisure guest. From the tranquil Mediterranean decor to the stylish professionalism of the Courtney Suite conference hall, the environment is unique. There are 101 suites each with a large executive bedroom and an innovative communications area, featuring e-mail and internet access and even video conferencing and fax facilities if you need them. The impressive facilities are everything you would expect of one of the most exceptional international business, conference and banqueting venues in the Liverpool area. For business delegates, there are 12 high-tech, high-spec conference rooms and the superb leisure facilities include a gymnasium, sauna and swimming pool. At the end of a hard working day, the excellent Handley's restaurant offers superb cuisine. Offering convenient, comfortable accommodation, Premier Inn Wirral (Greasby) is a 5-minute drive from Upton Train Station and 5 miles (8 km) from Birkenhead town centre, with excellent motorway access. Some of the comfortable rooms at Premier Inn can accommodate 2 adults and 2 children (under 16 years). The 2 children are also served a free full breakfast, when accompanied by an adult eating a full breakfast. The full all-you-can-eat breakfast includes cooked items, vegetarian options and a wide continental selection. Premier Inn Wirrall (Greasby) is next to The Twelfth Man Two for One restaurant, offering a varied menu in a welcoming environment. There is a 24-hour reception and free parking at this Premier Inn. Convenient for Birkenhead and Ellesmere Port, this Premier Inn has great beds, a Greene King restaurant and free parking. 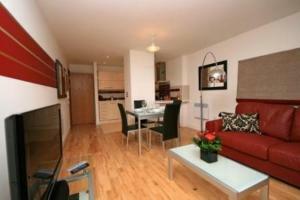 It is a 10-minute walk from Bromborough Rake train station. Local attractions include a cinema and bowling alley. A bus stop is within walking distance of Premier Inn Wirral. Some rooms at Premier Inn can take 2 adults and up to 2 children (under 16 years). The 2 children also get a free full breakfast when accompanied by an adult eating a full breakfast. The full all-you-can-eat breakfast has the expected cooked items, including vegetarian sausages, as well as a wide continental selection. With striking views over Albert Dock, Hilton Liverpool has a fitness centre, a swimming pool and contemporary rooms. Liverpool One shopping complex is a brief walk away. Sample the contemporary menu at The Exchange Restaurant, with park views. 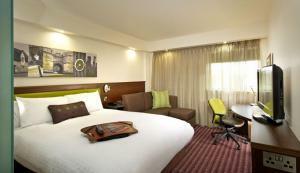 All stylish rooms feature a 32-inch LCD TV and comfortable beds. Hilton Liverpool is a 20-minute drive from Liverpool John Lennon Airport and is less than 1 mile from Liverpool Lime Street rail station. With its grand original Victorian fa?ade, this AA 3-star hotel has superb facilities and a great location, right on the promenade, enjoying panoramic views over the coastline of the North-West. As a member of the world's largest group of fine independent hotels, the Best Western Royal Clifton Hotel offers comfortable, high-standard accommodation. 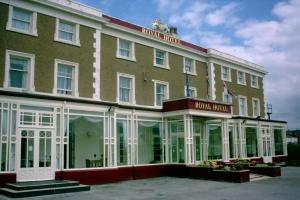 The hotel is conveniently located for visiting Liverpool, Chester, North Wales and the Lake District. Whether you are exploring the region as a tourist or visiting the area on business, the tastefully furnished en suite rooms are great as a relaxing base. Many of the rooms offer panoramic views of the immaculately kept lawns and flowerbeds of the Kings Gardens and the seafront. The hotel also offers an impressive selection of dining options, great conferencing facilities and superb leisure facilities, including an impressive spa offering an array of relaxing and therapeutic spa treatments and facilities. Ideally situated, Elysian Fields offer a range of stylish 1 and 2 bedroom apartments, a 10-minute walk to Liverpool city centre and Liverpool Lime Street Train Station. Some apartments benefit from balconies with picturesque views of the cathedral and Liverpool skyline. Features include comfortable beds, contemporary bathrooms, a flat-screen TV and a modern seating area. Elysian Fields provides secure on-site parking and there is a 24-hour concierge service. Guests will receive a welcome pack on arrival. Anfield and Liverpool F.C are a short taxi ride away, while there is a brief 5-minute walk to Albert Dock and Liverpool One shopping centre. On request, the bed set-up can be 2 double beds or 4 single beds.